I was recently watching the 1970s British television production of Robert Graves’ I, Claudius. In it there was a wonderful line (at least if you happen to be a Roman history buff) that particularly struck me. The line, spoken by Herod Agrippa, was to the effect that the tree of the Claudians bore only two kinds of fruit, the sweet and the bitter. It is interesting because it is a theme that comes up recurrently in the writings of the Roman historians, a fact with which Graves was doubtless familiar. Indeed, Suetonius begins his account of the life and reign of the emperor Tiberius (full name: Tiberius Claudius Nero) with a mini-history of the clan’s colorful members. There were actually two main branches of the gens Claudia, one patrician and one plebeian. Because the plebeians seem mostly to have been a pretty decent lot, the line in I, Claudius mainly refers to the patrician Claudii. Although there were some decent Claudians among these as well, I’ll mostly be examining the bad apples, of which there were a disproportionate number in the barrel. The gens Claudia was founded by a man named Attus Clausus, a wealthy nobleman from the Sabine town of Inregillus. Rome was at war with Inregillensis, a war which, for reasons somewhat obscure, Attus Clausis could not support. So around 501 BC he packed up his household and his large number of clients and retainers, and he moved to Rome. For reasons which are also obscure, the Romans welcomed him with open arms, made him a citizen, assigning him land to settle on, and even admitting him to the patrician class and making him consul in 495 BC. In Rome his name was Latinized as Appius Claudius. Thus, we could say that, if he was not necessarily a bad man, the first Roman Claudius was at least a contrarian and rebel. Livy says he was “harsh by nature” and “loved tyranny”. He took a hard line against the plebeians in a debt crisis, precipitating the latter’s first secession from the state, and initiating the long “Struggle of the Orders” between plebeians and patricians. This Appius had a son, Appius Claudius Crassus (Crassus = "fat"), who earned the further nickname “the Decemvir” because he was among the committee of ten men charged with codifying the laws of Rome. This codification was the famous Twelve Tables of 450 BC. Unfortunately, this Appius was reluctant to give up his power after his year in office was over, and seemed to have designs for tyrannical power. Furthermore, he seems to have developed an uncontrollable lust for Verginia, the daughter of a centurion, who was betrothed to a tribune of the plebs. He had one of his clients try to claim her as his slave in court. To cut a longish story short, Verginius, the girl’s father, stabbed his daughter to death in the forum, the only way he felt he could prevent her from being dishonoured by Appius. The people were enraged and, depending on the account, they either murdered Appius, or he committed suicide before they had the opportunity. A few generations later there was Appius Claudius Caecus (Caecus = “the blind”), consul in 307 BC and 296 BC, and dictator in 292 BC and 285 BC. He was in many ways quite a respected figure, mostly for his instrumental role in spearheading Roman resistance to the invasion of Pyrrhus of Epirus. Unfortunately, he did possess the characteristic Claudian arrogant streak. He had a road (the famous Appian Way) and an aqueduct built, naming them both after himself, thereby becoming the first Roman to do so. As censor, he removed the care of the cult of Hercules from the patrician Potitii and Pinarii clans, and put it in the hands of public slaves. For this act of impiety, the angry god extinguished the two clans for allowing the transfer, and struck Caecus with blindness. Also, Caecus angered the patrician class for having his secretary, a freedman, publish the legis actiones (the list of legal actions), previously kept as the secret knowledge of the priests. In addition, he made that same freedman a senator. Caecus’ son (or grandson?) was Appius Claudius Caudex (Caudex = “blockhead” or “idiot”). I have been unable to find an explanation for his unfortunate nickname, as his generalship seems to have been exemplary. However, I am tempted to group him with the bad apples because of it. A case can be made for this, as his actions were partly responsible for involving Rome in the First Punic War. 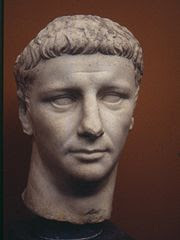 The brother of Caudex was Publius Claudius Pulcher (Pulcher = “pretty boy”). He was consul in 249 BC and was put in charge of the Roman fleet during the First Punic War. He ignored the omens before the battle of Drepana; when the sacred chickens refused to eat, he threw them overboard, saying, “Since they refuse to eat, let them drink.” He lost the battle, along with almost the entire fleet. He later committed suicide after charges were brought against him for impiety and incompetence. From then until the first century, the Claudians seem to be less controversial, their natural tendency towards psychopathy not really resurfacing until Publius Clodius Pulcher. This Pulcher adopted populist tactics to achieve power. Because he was a patrician he was barred from becoming tribune of the plebs, so he had himself adopted into a plebeian family and changed his surname to Clodius (reflecting the plebeian pronunciation). He ingratiated himself into the affections of the mob by instituting a grain dole. He became infamous for having snuck into a ceremony honouring the Bona Dea (“Good Goddess”), being held by Pompeia, wife of Gaius Julius Caesar in 62 BC. It was an event open to women only, but Clodius entered dressed as a woman. He was discovered, precipitating the divorce of Caesar from his wife. Clodius meanwhile, perjured himself in court over the affair, in order to escape prosecution. After this Clodius became more dangerous and desperate in his political tactics, resorting to the recruitment of an army of street thugs to intimidate his enemies, two of whom were Cicero and Titus Annius Milo. This gave rise to a bad precedent, as others started to do the same. Clodius was himself beaten to death by the hired thugs of Milo in 53 BC. During the Imperial period, the Claudian tree seemingly begins to drop even worse fruit, and much more of it. Here one need only reflect upon conduct of the emperors Tiberius, Caligula, and Nero. Perhaps it had to do with the possession or allure of absolute power. Perhaps it had to do with the fact that generations of cousin marriage meant that the Claudian tree no longer forked. In any case, the Claudii effectively ended up extinguishing their own line through intra-familial murder (thus making my own family's relations seem peaceful by comparison). But for this Imperial history, I recommend watching I, Claudius.